Michele Carnevale is one of those persons who never give up. Surely a positive quality, especially if, and this is the case, knowledge and experience are supported by the human perseverance. After several experiences in well known yards and the necessary training time, he has finally design his first boat. Innovazioni e Progetti, is a yard which have shown a great flexibility and which have a strong building background especially in high quality and market oriented boats. The yard and the designer have worked closely together to create a boat which take into account the demands of the experienced boater. The 256 Flares is the perfect result of this research. 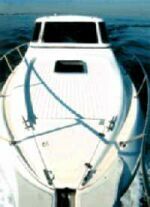 The boat, introduced at the last Genova International Boatshow, is 9.20 meters LOA while the register length is 7.49 meters: this is an interesting factor especially for the Italian market, because the craft is, according to the Italian regulation, a small craft which do not need registration. The nice overall lay-out of the 256 Flares ensure a comfortable internal habitability. The joiner work is elegant with its bright finishing while privacy and comfort are ensured by the two cabins and the separated bathroom both extremely spacious. The bow cabin feature a vanity usually found only an larger boats, while the sliding roof give plenty of light and ventilation to the saloon. The convertible pilot seat makes the galley working top larger in few seconds. On deck the 256 Flares is comfortable and spacious, without disregarding safety. Performance are interesting, although they are achieved with relatively small engines. Stability and riding comfort are really outstanding. The 256 Flares is a small/large boat: "small" for its register length (an advantage for the Italian market) and "large" for all the features which are included in this 9.2 meters LOA craft, thus achieving an interesting value for price ratio. Winch, batteries charger, windshield wipers, aft door, cockpit and deck cushions. Construction material and detailing: reinforced fiberglass, swimming platform with teak planking and ladder, swimming platform to cockpit passage way, 4 cleats and 4 fairleads, 4 grabrails, sliding roof, aft sliding door, beak and handrail, bow sunbathing area and hatch. Lockers number and place: two underneath the cockpit's settees, chain locker, two underneath the swimming platform, several below deck. Deck: stainless steel fittings and toughened glass windows, cockpit side settees. Interiors: the main saloon include the convertible U shaped dinette and the steering station. The fully hidden galley area is placed to the starboard side and is fitted with: sink, stove, working top, refrigerator and lockers. The owner cabin feature a double bed, the wardrobe and a vanity area with settee. The bathroom has two entrances and include the shower. The aft guest cabin feature a double bed and lockers. The furniture is made of cherry and mahogany wood, upholstery is cotton. Mahogany saloon sole. Steering comfort: the steering station is placed to the saloon's starboard side and is fitted with: hydraulic steering, adjustable steering wheel, throttles, pilot seat and compass.